Whew, today was a doozy. Started off well with an early morning start and a whole lot of optimism. We hoped to hike 17 miles, to a cafe that would be open, to fill up on water and enjoy a treat or two. With lots of hours in the day and plenty of sleep, we were in good shape. But then the mountains happened. We knew there were mountains out here. We’ve hiked in this area before. But there’s something particularly difficult about walking uphill on a road. Especially when you see cars whizzing by with minimal effort. On the plus side, the views were absolutely stunning. We actually made great time and we’re feeling good until about 10am when the heat started to be an issue. (Claire wants to specify that “we” is really just her, Tenny is a superhero and is impervious to physical pain). We didn’t see as many border patrol as we were expecting, maybe 5 or 6. Only one guy stopped to talk to us, so we assumed they radioed ahead to let everyone know who we were. We kept waiting for that bad interaction, but so far all of the border patrol we’ve spoken to have been extremely pleasant and helpful. Maybe we shouldn’t be so quick to judge, eh? 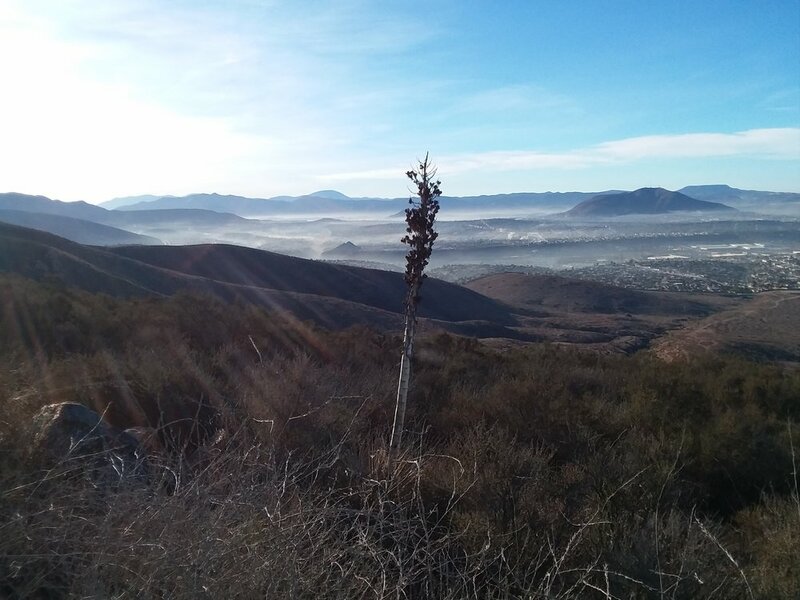 The road relentlessly climbed, affording some pretty spectacular views of the border and the Tijuana sprawl. We got a pretty good look at the eight prototypes of the wall that are referenced in this article (https://www.nytimes.com/interactive/2017/11/08/upshot/eight-ways-to-build-a-border-wall-prototypes-mexico.html). It would have been great to be able to see them closer up, but apparently the access is restricted. It was refreshing to be in mountains again, away from traffic, crowds, and people. This feels safe and familiar (as does the bitching and moaning about going uphill). The slopes were almost lush with green shrubs and western live oak intermittently adorned by pink, granite boulders. Nature! Finally we turned the corner and - flat! Or rather flat-ish. We started to gradually descend, winding through the mountains, maintaining the height and the views. In this case, we have the recreational motor vehicles to thank for the great trail. It’s not often that a hiker will willingly share their space with cars, but in this case, we were grateful. It was a beautiful road, and it was impressively maintained. Although, really, we probably have border patrol to thank for that. Even going downhill, the heat took it out of us. Our assets: it’s November, probably 20 degrees cooler than the summer temps, plenty of water, access to the road, and friendly greetings from border patrol. It is almost impossible to imagine how a person, in the heat of summer, with limited water, and a desire to avoid running into anyone, could survive out here. The bush is impenetrable, and everything that isn’t the road is a steep slope to nowhere. Steep as in on your hands and knees, getting a face full of thorns. At some point we saw a helicopter land, throwing up a ton of dust, but by the time we got there the road was empty. Feeling beaten down by the sun, the uphill, and our constant obsession with the theoretical ice-water we would drink at some point in the future, we quickly lost motivation and personality. Eventually we descended to Hwy 94, a scenic road that we had imagined to be a sleepy windy route with gentle and occasional cars. We were wrong, on many accounts. First off, GoogleMaps took us on a “shortcut” down somebody’s driveway. A quick look at the four barking dogs and heavy gate, should we rethink that plan? Rather than take the obvious backtrack that added a mile, we wandered for about an hour thinking that another option would present itself. It didn’t. We finally rerouted to the highway, where we joined an army of semi-trucks going 90 mph, and every flashy sports car in the world. In this case, “scenic road” was really just a euphemism for freestyle speedway. The slipstream from the passing semis was enough to push us off balance. And of course...uphill, just in time for the 2pm sun bake. Our earlier climb was gentle compared to this. This was rough. Even Tenny’s shoulders drooped, just for a second. We made it a couple miles up the road, before agreeing to throw in the towel. We had no promise of camping beyond Barrett Junction, just some unknown BLM land, and we wouldn’t make it there before dark at the rate we were moving. Unfortunately, Barrett Junction was our next water source, and wasn’t set to open until 11am the next day, a little late to be starting the hike. Oh well. We knew this hike was gonna require a little improvisation. Here’s to creative thinking! After fighting our way through some pretty gnarly brush, we found a clear spot right on top of an old water conduit. Not our best camp spot, the highway was about 50 feet away, although we were hidden by trees. Our main concern is that if it looks good to us, it looks good to others. The tent takes up the whole space, and there’s no way to get past us except through it. Already we’re breaking our rule: don’t camp in a path ideal for foot traffic. Sorry Mom and Dad...we’re just so tired. Right on cue our now dubbed guardian angel, John from Border Angels, called to check in and inquire about our safety. Could he sense our risky decision? We appreciate the telepathic thought! Good night John!